Welcome fellow Recovering Traditionalists to Episode 1. 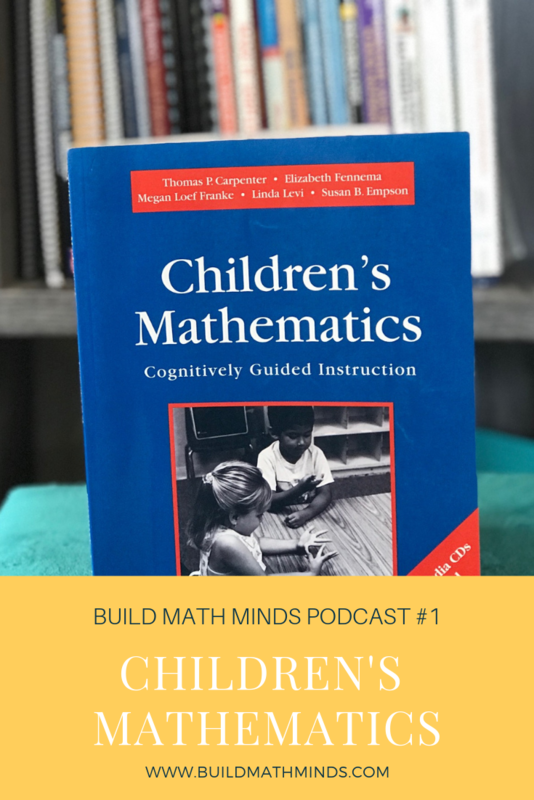 Today we are looking at an insight I got from one of the books that forever changed my life, Children’s Mathematics: Cognitively Guided Instruction. Now this book is full of goodness and you’re probably going to hear multiple podcast episodes about this book. But, the insight I want to share with you today came from one of the last chapters of the book and it’s on page 105 in the original version of this book. There has been a new version that came out but I went to my original version for this episode. That one hit home for me because I wasn’t using my students thinking to plan instructional decisions. I was using my textbook. I was flipping lesson by lesson just doing the next thing in the book. And cognitively guided instruction is about using your students thinking at the time. Their cognitive abilities at the time to guide your instructional decisions. And this was a tipping point for me. It was the point where I realized I couldn’t rely on my textbook. The textbook was a great resource for me but what truly mattered was not getting through the textbook. What mattered was using the knowledge my students had at the time to guide my instructional decisions to get them to the end goal of a standard. The end goal should not be getting to the end of your textbook. And the book, Children’s Mathematics: Cognitively Guided Instruction, helped me realize that. It helped me gain more knowledge about students thinking so that I could inform my instructional decisions. That was the hard part for me, was that I was flipping lesson by lesson in the textbook because I didn’t know any better. I did not have and understanding of my students thinking and their natural progression and developing their mathematical thinking. So, I didn’t know what to do next so the textbook was a resource for me. It was not just a resource honestly, it was my bible to go through. It’s like this is what it tells me to do next. But now, as I’ve gained more knowledge about how students think about their progression and their mathematical thinking, I can use that to guide my instruction. And if you want to dig a bit deeper into learning about how kids develop their mathematical thinking then I highly encourage you to check out the book, Children’s Mathematics: Cognitively Guided Instruction. Cognitive skills are so important and tuning into my students’ cognitive abilities helped me to gain insights into their learning potential and progression. As I listen to this episode I am reminded of the heavy duty text books my kids and students had to haul around in their backpack. Truthfully, the oversized textbooks were a major health concern for many parents whose students later developed early back problems. I’m grateful for the significant shift in the past 3-4 years were we’ve scaled down on textbooks and scaled up on teaching teachers about CGI through wonderful PD resources like BMM.